The mission of the Youth Symphony of Kansas City is to challenge, educate and inspire students through meaningful and enriching musical experiences. 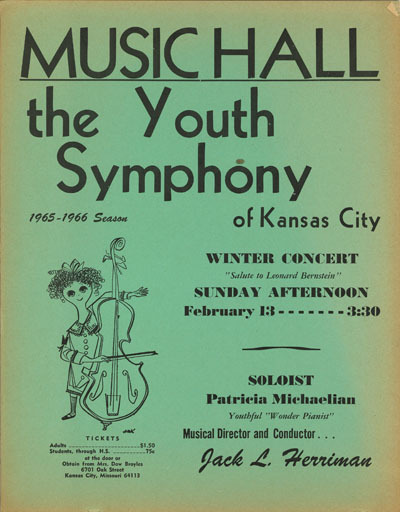 The Youth Symphony of Kansas City was founded as “The Youth Symphony of the Heart of America” by conductor Leo Scheer in 1958. The organization initially consisted of one orchestra of 80 musicians. Incorporated on July 31, 1958, the organization has endured a long and interesting history as the musical home to young musicians in Kansas City. The first concert was held on September 6, 1958 at which time Mayor H. Roe Bartle proclaimed the week as “Youth Symphony Week”. In 1959, Conductor Scheer resigned and was replaced by Richard Cormier, a member of the then-Kansas City Philharmonic (now Kansas City Symphony) and faculty member at Park College (now University). 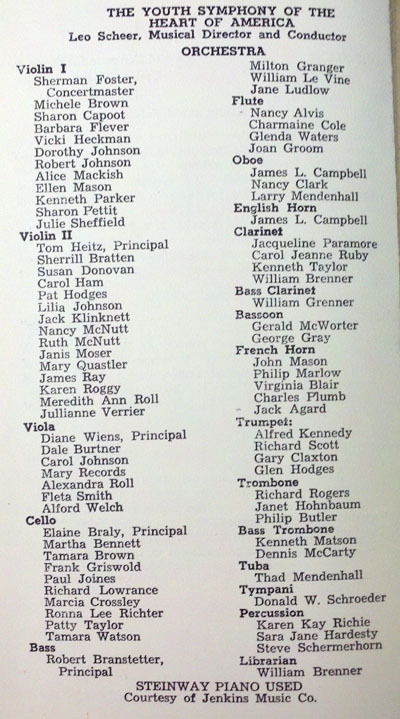 In 1964, the organization added a younger orchestra the “Junior Youth Symphony” due to increased demand. The Youth Symphony toured Chicago, Washington D.C. and New York, performing at the 1964 World’s Fair in New York.In 1961, Conductor Cormier resigned and was replaced by Jack Herriman, associate conductor of the Kansas City Philharmonic. In the same year, the organization changed its name to “Youth Symphony of Kansas City and also joined the American Symphony Orchestra League – now known as the League of American Orchestras. The Symphony also recorded a concert for New York radio station WNYC. In 1978, Conductor Herriman resigned and was replaced by Michael Krajewski. Conductor Krajewski served until 1983, at which point Conductor Glenn Block was hired. 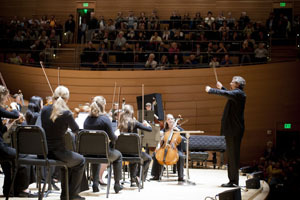 In 1990, the Youth Symphony began a long association with the American Royal – performing live for its Concert of Champions. Also in 1990, the Youth Symphony toured to Chicago to participate in the Midwest Band and Orchestra Convention. In 1991 a third orchestra was formed to accommodate the growing number of talented young musicians. The orchestras were renamed to Senior, Middle and Junior Orchestra. In 1995, these names were again changed to Symphony, Philharmonic and Symphonette, respectively. In 1997 the Symphony toured New York and performed at Carnegie Hall in June. Mr. Block served as Music Director of the Symphony Orchestra until 2007, at which point current conductor Steven D. Davis was hired. Today, the Youth Symphony of Kansas City is comprised of four full orchestras. More than 450 young musicians participate annually. In summer 2015, a Summer String Camp was added. In June 2016, the Youth Symphony toured Ireland — its first international tour in a decade. A new young strings program — the Overture Program — launched in the 2016-17 season. June 2018 brought the Youth Symphony’s second recent international tour, this time to Austria. Performances took place in Salzburg and Vienna. Following 20 years of musical contributions as a conductor within the Youth Symphony, conductor Russell E. Berlin retired in 2017-2018. Mr. Kirt Mosier has been named as Mr. Berlin’s successor and will conduct the Academy Orchestra and serve as Artistic Director of the Youth Symphony of Kansas City. A partial list of conducting staff throughout our history: Leo Scheer, Richard Cormier, Jack Herriman, Michael Krajewski, Larry Williams, Dennis Herron, David E. Circle, George C. Alter, Jim Funkhouser, Glenn Block, Jeff Jacobsen, Jonathan Lane, Jeffrey Bishop, Mary Lou Jones, Joseph Keeney, Scott Kuhlman, Carrie Turner, Russ Pieken, Russell E. Berlin. Read more about our current Artistic Staff.